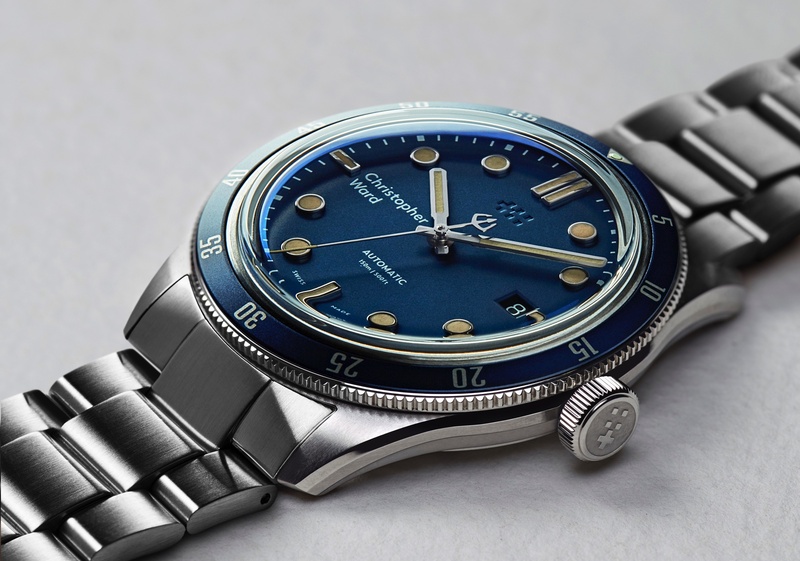 Skywatch is an interesting new US based watch brand that produces affordable Swiss quartz timepieces. Skywatch currently makes two collections: 3-hand and chronograph. 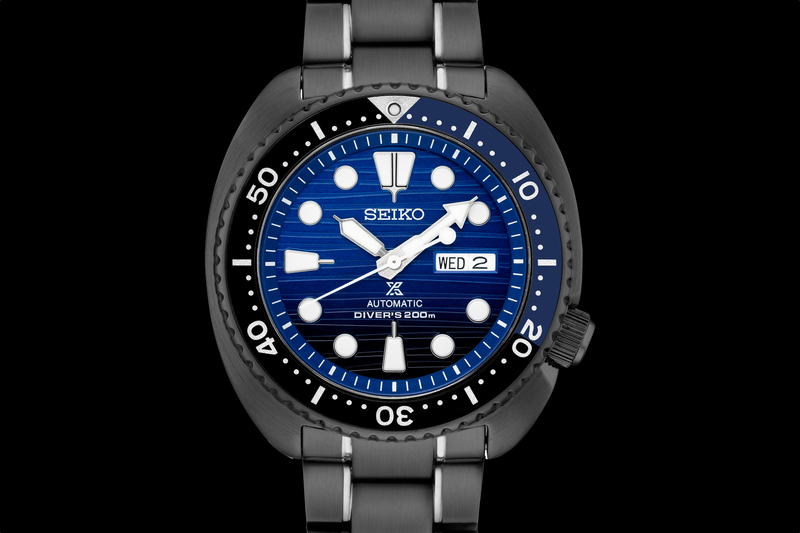 The 3-hand collection is available in 38 mm or 44 mm diameter case sizes (pictured). The chronograph collection is only available in 44 mm diameter cases. The Skywatch 3-hand models (hours, minutes, seconds and date), are powered by Swiss made Rhonda 515 quartz movements. Cases are constructed from stainless steel, with optional black-IP or rose gold-plating. The bezel is similar to the sapphire crystal bezels seen here and here — although instead of sapphire it is made of epoxy. 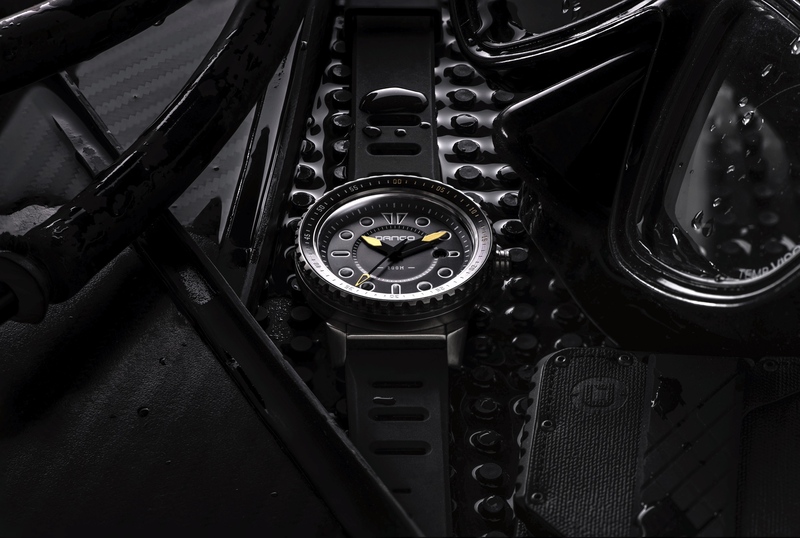 Skywatch achieves a look similar to the famous Blancpain Fifty Fathoms, at a fraction of the cost. Skywatch uses mineral crystals on all their timepieces. Mineral crystals are more scratch resistant than plexiglass, but not sapphire. The strap is made of premium Italian sailcloth with a nubuck leather lining and the brand’s signature blue loop. The caseback is solid steel. The crown is non-locking. Water-resistance is 100 meters. On the wrist, the 44 mm 3-hand Skywatch has an excellent fit. The combination of a relatively thin case, tapered lugs and pin buckle strap result in a timepiece that feels very comfortable on the wrist. The uni-directional bezel rotates with ease and precision. The domed crystal looks good, although the lack of anti-reflective treatment can make it slightly hard to read in bright lighting conditions. Conversely, it is very easy to read in low-lighting conditions due to the generous amount of lume that has been applied to hands, bezel and markers. Skywatch offers distinctive Swiss made timepieces, with a luxurious feel, at a price that doesn’t break the bank.